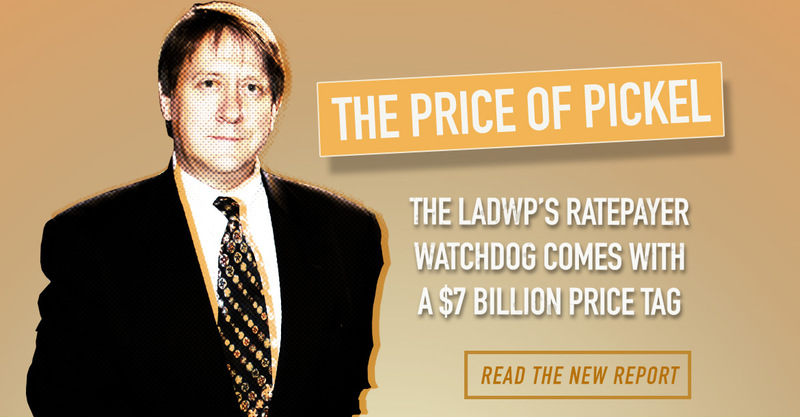 Santa Monica, CA — Instead of pushing the country’s largest municipal utility to be leaner, greener, and meaner, Fred Pickel, the first ratepayer advocate ever appointed to protect the interests of LADWP ratepayers, has fallen down on the job. A new report, “The Price of Pickel” by Consumer Watchdog, finds that his failure to speak up for ratepayers against unreasonable rate hikes and bad projects is costing ratepayers nearly $7 billion. For the report, click here. “It's time to hire a ratepayer advocate to start fighting for people and stop rubberstamping wasteful projects that unfairly cost Los Angeles families,” said Brenna Norton, Southern California Organizer for Food & Water Watch. •Pickel endorsed power and water rate hikes of $1.1 billion between 2016 and 2020 without questioning whether other monies might be available to offset rate hikes on burdened ratepayers when the utility holds $1.6 billion in cash reserves. •Pickel endorsed a new 5-year IBEW contract in 2017 hiking salaries by 13-22 percent for a total $280 million when DWP employees are among the highest-paid utility workers in the country and earn two-and-a-half times more on average than other workers in comparable L.A. jobs. But he raised no red flags on unfunded DWP worker pension and post-retirement medical liabilities calculated at $3.8 billion by an independent watchdog. •Pickel has not weighed in against spending $731 million through 2020—and a total of $2.4 billion by 2025—to refurbish vastly overbuilt and polluting natural gas power plants. But he criticized a successful solar program to pay large-scale commercial and residential developers for power sold back to DWP at a fraction of that tab for being too expensive. •Pickel stayed silent on illegal transfers to city coffers of “surplus” power rates of about $1 billion since 2012 to be used for purposes other than utility services. The annual transfers amount to an illegal tax under 2010’s Prop 26, which mandates that the public must vote on the use of rates for purposes other than improving utility services. •In 2017, Pickel endorsed as “affordable” for ratepayers a plan to shoulder up to $140 million annually during drought years to fund Governor Jerry Brown’s controversial North-South water diversion project, though ratepayers will not see additional water supplies from the scheme that subsidizes massive agricultural interests. •Pickel has failed to improve customer service that ranks at the bottom of major Western regional utilities, starting with failing to fend off a massive, but avoidable, software billing scandal in 2013. The $193 million system is costing at least $20 million to fix, while a legal settlement calls for DWP to pay ratepayers back $67.5 million for rampant overbilling. The report concludes that Pickel, appointed in 2012 by Mayor Eric Garcetti to head a newly created LADWP Office of Public Accountability, must be replaced. The office must be overhauled and granted investigatory powers.